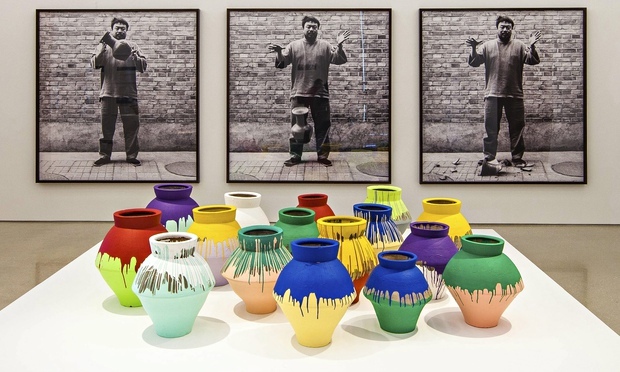 Until 13 December 2015, the Royal Academy of Arts on Piccadilly is hosting a major exhibition of Chinese artist Ai Weiwei. Throughout the Academy’s largest gallery rooms, it is important to take your time when observing Ai’s work, and perhaps to walk through it a second time. While I am no expert and do not visit nearly enough contemporary art shows, I wondered how contemporary art can be anything but political. This is a photograph taken in one of the rooms. We can see vases painted in various colours, as well as three large black and white photographs of Ai himself. The three photographs show him dropping an ancient vase that he purchased in the 1990s. Ai is trying to show that the importance of ancient art has been forgotten in China. On the vases themselves, the dripping paint could show modern city landscapes, with high buildings. The photographs show how easy it is to just drop such an important ancient work without flinching. I thought this was pretty significant. This indifference is echoed, in yet another piece, in the description of how certain public buildings are built in China, and how no effort is put into them surviving an earthquake. A further strong piece presents a tree-like installation made of wooden pieces of many different shapes, including chair shapes. The description explains that from above, if one looks at this construction, one sees an outline of the Chinese territory, as if on a map. We however, who see it from underneath or inside, can’t discern this shape. Another point is that in addition, we can walk through this sculpture. Ai is trying to show that we as tourists and visitors can walk through China freely, while many Chinese citizens are not even allowed to, in their own state. Finally, as a penultimate piece, we see four large boxes which, when you look inside, retell the time he was incarcerated in China because of his art. While he was not allowed to tell anyone about his time of imprisonment, he did it anyway. It is humbling to be reminded that some of us will never know what courage of this kind means: the courage to scream when it could actually crush you. How do you begin to lead your reader through nine distinct and highly educational rooms that constitute an exhibition? Chronologically? Sure… And, tell me, how do you do this if the exhibit’s subject is a playwright who no longer needs introduction, if its rooms are intertwined within an apple shape in the centre of the British Museum, and if its “objects” go from coins and instruments to screenings and podcasts uttering words that can’t help but make you smile and nod? Some events, and certain exhibitions, are not imaginable if one has not been to them… Hence, I’d like to take you out into the streets of London thanks to this short video which served as a trailer for Shakespeare: Staging the world. The words we hear are a mix of those of Ben Jonson, who wrote the introduction to the first publication of Shakespeare’s plays (the First Folio, 1623). Sweet swan of Avon – What a sight it were to see thee in our waters yet appear – Soul of the age – The applause; delight; the wonder of our stage – My Shakespeare rise – Thou art a monument without a tomb – And art alive still, while thy book doth live – Triumph, my Britain! Thou hast one to show – To whom all scenes of Europe homage owe – He was not of an age – But for all time. I do find this video a tad over dramatised, but I must admit that it shows a part of how I feel and what I see when I exit the Globe, and how I have felt during these Olympics. It is as though the discovery of a way of writing that is specific to an era long past has made me more curious than ever about the history of this city, about the people who lived in it, their own baggage, neuroses, aspirations, jealousies, rejections and loves. This is what is shown at the British Museum: parts of history that, if one looks close enough, are omnipresent in Shakespeare’s plays. And why wouldn’t they be? This was a man who loved his country, in particular the country (Warwickshire) which he lived in. He described small and big events, always focusing on the human beings – their fears, incomprehensions, but also surprises and laughs – who are simply trying to survive and be remembered on these small but unique islands which form Great Britain. There seems to be a lot of Will Shakespeare floating around The Balcony these days and I admit there is even more to come – I just hope you will not run away.